The second the weather turns around and the air starts to warm up the first thing on my mind is to PARTY. Sunset cocktails, yes. Light seasonal bites, yes yes. The new Party line from Cheeky at Target, yes yes holy yes! 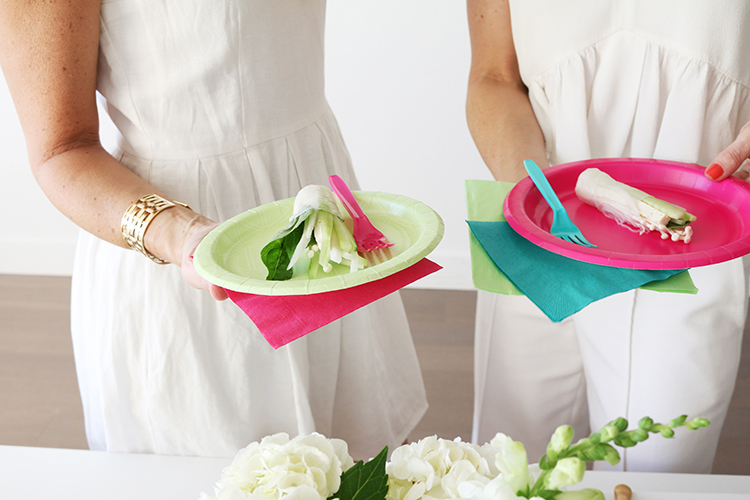 When we found out that Cheeky launched a party line of paper plates, napkins and cutlery we emptied the shelves at our local Target and got to planning. Each piece in the collection is brighter then the next with bold colors and soft white graphics. 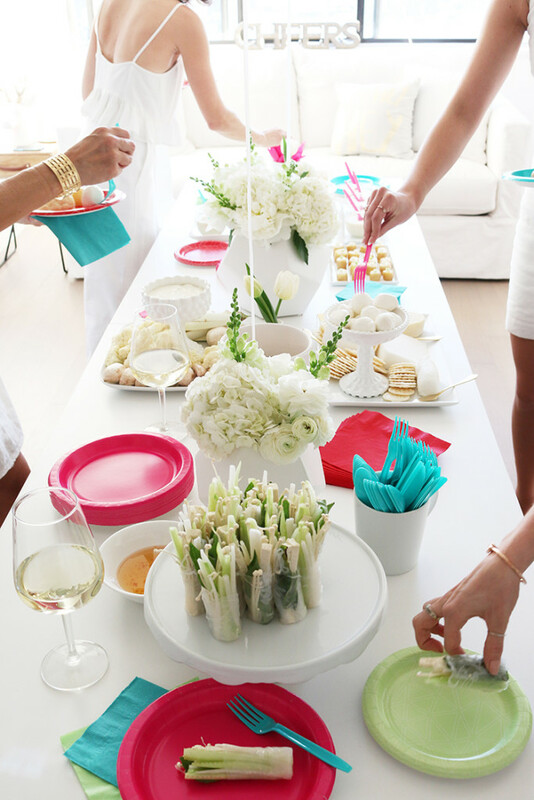 We thought…how about a WHITE party. ALL WHITE. The decor, the food, the dress code….AND…Cheeky will be the STAR. That’s exactly how this all played out. We logged onto our favorite invitation website, Minted and used one of their brand new online designs to send our invite. With a click of a button all the work was done for us. RSVP tracking, reminders and a final tally. We were ready to party! We set the table with modern white vases and fresh white flowers found in the farmer’s market that morning. We thought it would be pretty chic to add a couple of jumbo white balloons which always scream PARTY. We devised a menu of all white foods including a white vegetable crudités with a blue cheese dip, celery root soup topped with creme fraiche, potato rounds topped with creme fraiche and scallions, an assortment of white cheese and crackers and last but not least, sweet white vanilla cupcakes. One item that we were not confident in making on our own were white summer rolls. So we asked our darling friend Chef Karen Ferries, the Cocktail Party Chef for some help...I think it's save to say she nailed these. And boy they were delicious! Our guests arrived wearing white and each gal looked gorgeous then the next. We played a super fabulous playlist on our Spotify and poured white wine and processco throughout the night. The highlight of course…was when out came…. Pink, Teal, Green and Red….how fab is this stuff? There is no doubt Cheeky was the star of our show. Gavin even made an appearance at our party. He came over showered and wearing a white popped collar shirt, dressed to impress his best friend, Ali. The night was absolutely lovely with great friends, food and beautiful tableware. Want to know the best part of this all? Cheeky gives a meal for every pack you buy in partnership with Feeding America. Their products are very easy to find in (my favorite store as I’m sure you know if you follow LMP on Snapchat) TARGET, specifically in the party department. Partying AND doing something amazing for the world? Sounds good to me.